NEW YORK (AP) — If you don't like coffee or tea, Mountain Dewhas a new breakfast drink that might perk you up. PepsiCo Inc. is rolling out a new drink called Kickstart this month that has Mountain Dew flavor but is made with 5 percent juice and Vitamins B and C, along with an extra jolt of caffeine. The company, based in Purchase, N.Y., is hoping to boost sales by reaching Mountain Dew fans at a new time of day: morning. PepsiCo said it doesn't consider Kickstart to be an energy drink, noting that it still has far less caffeine than drinks like Monster andRed Bull and none of the mysterious ingredients that have raised concerns among lawmakers and consumer advocates. But Kickstart, which comes in flavors such as "energizing orange citrus" and "energizing fruit punch," could nevertheless give the company a side-door into the fast-growing energy drink market without getting tangled in any of its controversies. The drink comes in the same 16-ounce cans as popular energy drinks made by Monster Beverage Corp., which also offers options with juice content. And the TV ad features young men skateboarding, reminiscent of the marketing themes used by energy drink makers. Simon Lowden, chief marketing officer for PepsiCo's Americas beverages, says the idea for Kickstart came about after the company learned through consumer research that Mountain Dew fans were looking for an alternative to traditional morning drinks such as coffee, tea and juice. "They didn't really see anything that fit their needs," he said. 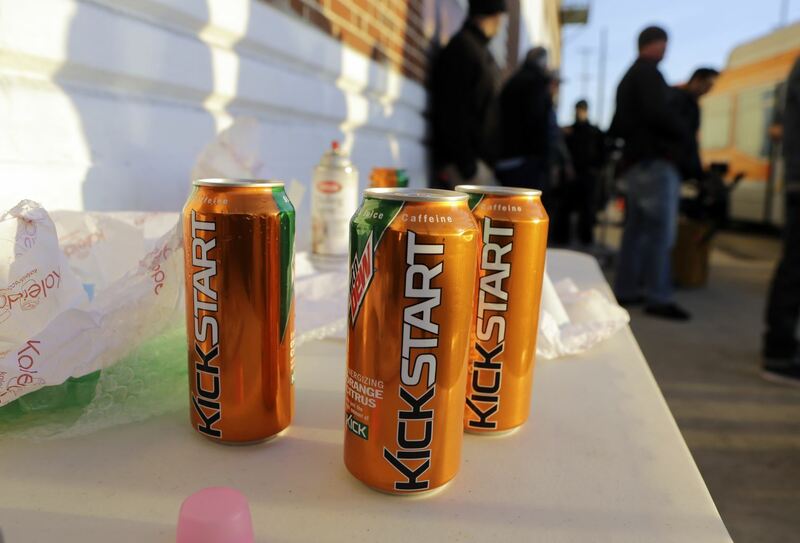 Lowden said Kickstart was developed independently from a Taco Bell breakfast drink introduced last year that combines Mountain Dew and orange juice. PepsiCo says Kickstart, which is carbonated, is also not a soda because its 5 percent juice content qualifies it to be considered a "juice drink" under guidelines set by the Food and Drug Administration. A spokeswoman for the FDA said the agency doesn't have definitions for what qualifies as a soda or an energy drink. With the growth of energy drinks such as Monster and Red Bull expected to slow, Kickstart could also signal the emergence of a new category that plays off the promise of energy and other health benefits, said John Sicher, publisher of the trade journal Beverage Digest. In a nod to the growing concerns about sugary drinks, for example, Kickstart also uses artificial sweeteners to reduce its caloric content to about half that of regular soda; a can has 80 calories. "It's a very interesting experiment capturing a number of attributes," Sicher said, likening it to Starbucks' Refreshers drinks, which promise "natural energy" from green coffee extract. The promise of "energy" has been a big seller in the beverage industry in recent years, with the energy drink market increasing 17 percent in 2011 even as broader soft drink consumption has continued to decline, according to Beverage Digest. PepsiCo and the Coca-Cola Co. have largely watched that growth from the sidelines, however, with players such as Monster Beverage and Red Bull dominating the market. But the surging popularity of energy drinks has also led to sharper scrutiny. This summer, New York's attorney general launched an investigation into the marketing prices of energy drink makers including Monster and PepsiCo, which also makes Amp. Lawmakers and consumer advocacy groups have also called on the Food and Drug Administration to investigate the safety of the high levels of caffeine in energy drinks for younger people. Although Kickstart may look like an energy drink, it has far less caffeine, at 92 milligrams for a 16-ounce can. A comparable amount of regular Mountain Dew would have 72 milligrams of caffeine while a can of PepsiCo's Amp energy drink has 142 milligrams, according to the Center for Science in the Public Interest. By comparison, a 16-ounce cup of Starbucks coffee has 330 milligrams of caffeine. I know some of you fools don't drink coffee(Chrissy) and you love a good old Mountain Dew to kick ya in the pants. This is prefect for your morning commute to work.